Anyone who has been to the Oregon Coast Aquarium knows that there is something special about Port Orford and the Orford Reef. They have an entire exhibit named after it, after all (and it’s diveable!). While most of the best diving around Port Orford is offshore and requires a boat to access, the Port Orford jetty and Graveyard Point is diveable from shore. 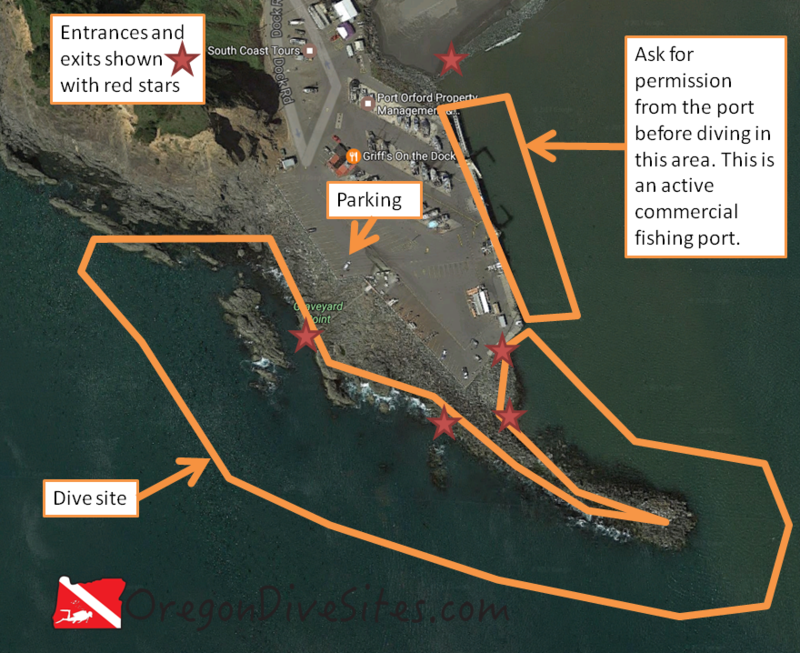 Recreational SCUBA divers who don’t mind making the drive to Port Orford are rewarded with excellent diving and marine life all within steps of an air fill station at the port office (as of the last time we checked), good food right in the harbor, and a good story to tell. Port Orford is one of the few ports in the USA where ships are raised out of the water when they come into port. Depending on the weather, the inside part of the dive site might be the better bet. The western outside area is more exposed to the Pacific Ocean. The area along the dock should only be entered after obtaining permission from the port authorities. If a vessel is being raised out of or lowered into the water, or a boat is being unloaded of her catch, you shouldn’t try diving the dock. The Port Orford jetty and Graveyard Point is a good place to go diving from the shore right in the middle of some of the best diving in Oregon. You’re right in the middle of Port Orford, Oregon when you’re diving on the jetty and Graveyard Point. From US101, head south on Harbor Drive. Harbor Drive turns into Dock Road. Head down the hill. Drive out through the marina until you see the parking area on the west side. The last time we were here, parking was free and plentiful. Double-check when you arrive to make sure this is still the case and that you’re parking in the correct area. This site wraps around Graveyard Point and the port jetty. The western side of the site is more exposed to the ocean so conditions can be rougher. Only attempt the western side in favorable conditions so that you don’t get dashed on the rocks. The eastern side of the site is more protected and usually has calmer water. Only enter the dock area if you have pre-arranged permission from the port authority and no ships are present. There are several places to enter and exit depending on what part of the site you’re diving. Along the dock wall there are several ladders that go down to the water. Ask for permission from the port authority before using them to make your entrance/exit. At the southern end of the parking lot, you can scramble down on the east side of the jetty to make an entrance. This is a fairly lengthy scramble. Make sure to scout out your route before you slog down to the water. You can also enter on the west side of the jetty. Watch conditions before you try to make your entrance here. Further up along the parking area, there is a cement culvert that runs down to the water. Follow the culvert down over the rocks and you will find a halfway decent entrance/exit although the drop to the water can sometimes be a little much if the tide isn’t very high. It is common to have surf, surge, and current especially on the west side of this dive site. The east side is usually calmer and often can be dived when the west side is too rough. Depending on what the ocean is doing, visibility will be between 5 and 30 feet. Usually you’ll have a solid 15-20 feet of viz on the west side of Graveyard Point. On the east side of Graveyard Point, you often get more like 10-15 feet. This is all ocean water with no fresh water runoff to modify temperatures. Expect between 48F and 58F depending on the time of year. There is no best time of year here. The biggest thing is to watch ocean conditions and plan your dive around calmer weather. You’ll find about 35 feet of water at the deepest point along the west side of Graveyard Point. The tip of the jetty is about 25 feet deep. Divers with a few jetty entries under their belts should be okay here. However, conditions can rapidly deteriorate especially on the west side of the dive site. Advanced training and a solid backup plan are good ideas here. We rate this as an intermediate dive although conditions can rapidly deteriorate, especially on the west side, and make this an advanced or even an impossible dive. Don’t end up dashed upon the rocks like so many ships have done over the decades! Depending on where you park and where you enter, you will walk as little as 100 feet or as much as 1000 feet. The only reason for a surface swim here is if you get caught on the outside of Graveyard Point and need to make a swim inside the jetty to exit. It would be better to be underwater for that swim but realistically you’ll probably be coming up after a fun dive and realize that you don’t have enough air to make the trek to the other side. The port authorities are all nice people and it’s worth it to chat them up. One of them has a wealth of knowledge about other SCUBA sites in the area. As of the last time we checked, there is an air fill station at the port. You might need to call ahead to make sure someone is there to fill your tanks. Full service SCUBA shops are located inland (Grants Pass, Roseburg, Eugene) or down south (Crescent City). The restaurant on the dock is a good place to eat and a lot of fun. Otherwise, there are many other good places to eat up in town. We haven’t stayed overnight at Port Orford but there are a number of campgrounds in the area. Let us know if you have a favorite campground or hotel that is SCUBA diver friendly!